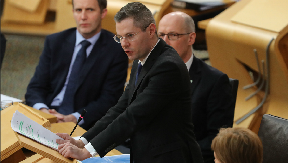 Derek Mackay has called for a 'meaningful uplift' in public services funding in the Budget. The Chancellor must follow up on a pledge to end austerity with "concrete actions" in the Budget, Scotland's Finance Secretary has said. Theresa May told the Conservative party conference earlier this month that austerity is over and "people need to know... that their hard work has paid off". Derek Mackay has called for a "meaningful uplift" in public services funding in Monday's Budget. The Finance Secretary has already written to Philip Hammond to asked for the rollout of Universal Credit to be postponed until issues are addressed. Mr Mackay said: "The Prime Minister recently announced she would bring an end to austerity and I want to see this delivered within the UK Government's Budget. "This statement must be backed up by concrete actions to provide a meaningful uplift in funding for public services, in addition to the funding increases announced for the NHS being delivered as a true net benefit and not offset by other cuts to the Scottish budget." He added: "I urge the Chancellor to ensure he produces a Budget that ends austerity, boosts the economy and properly invests in public services in Scotland. "This Budget also comes as the prospect of a no-deal Brexit looms ever larger - something which poses the biggest threat to the UK economy and public finances. "That is why the UK Government should commit to continued membership of the single market and customs union, if staying in the EU is not possible, which is around eight times larger than the UK market alone." Scottish Labour leader Richard Leonard has called on the Chancellor to change the rules on Universal Credit and Child Tax Credits. In a letter to Mr Hammond he wrote: "It has been widely reported that the forthcoming Budget will finally end the age of austerity that Britain has lived under for eight years now. If that is the case, the Budget must end the two-child cap on tax credits. "No single policy sums up the immorality of the age of austerity better than the two-child cap. "To punish families by limiting how much support they can get by their number of children is simply wrong. "In its first year, this policy has impacted on 3800 households in Scotland, and the numbers of the families affected will only grow." The Scottish Conservatives want the Scottish Government to spend "every penny" of extra funding from the Budget to be spent on health and social care. MSP Miles Briggs said: "We need to see more of our funding going to support GPs on the front line. "We need to see improvements to cancer treatment and it is time to cut the waste and inefficiency that is stopping doctors and nurses from getting on with their jobs. "The NHS in Scotland has a bright future. The SNP has run out of excuses. Let's see Nicola Sturgeon set out a plan not a grievance for once."